How much is a Raymond Mill with output size 1000-1250 mesh? Question: How much is a Raymond Mill with output size 1000-1250 mesh? Detail: How much is a Raymond Mill with output size 1000-1250 mesh? 1000-1250 mesh powder is superfine powder. The general Raymond Mill can process powder 80-400 mesh, can not reach the requirements of superfine powder processing. While the special Superfine Vertical Roller Grinding Mill can process 1000-1250 mesh powder. 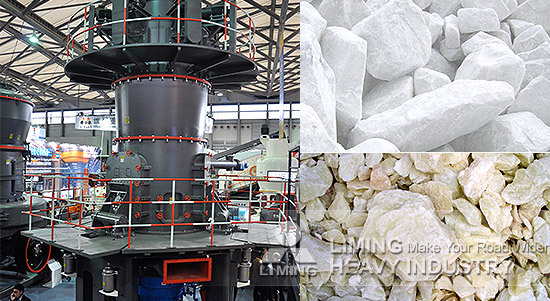 LUM Superfine Vertical Roller Grinding Mill is a new superfine powder equipment which is based on the LM Vertical Roller Mill and introduces the Germany advanced technology. It can be widely used for calcite, marble, limestone, talc, barite, dolomite and other non-metallic mineral processing. The output size of LUM Superfine Vertical Roller Grinding Mill is 400-1250 mesh, can be adjusted. It can meet the production requirements of 1000-1250 mesh. The capacity is general 1-18 tons per hour. Different types of equipment has different price. For more detailed specifications, you can contact with our online service! <<Previous：What is the price of stone crusher and sand making machine with capacity of 80 tons per hour? <<Next：What is the price of PE900*1200 stone production line?